Omaha Beach and the surrounding area offers an abundance of outdoor activities for all the family or maybe you just feel like lazing and enjoying the tranquility of bird song over a morning coffee or a long afternoon with a book and a wine, its all on offer at this modern, well maintained, sunny property. The large deck area can be fully enclosed to offer peace of mind for the little ones to explore while you cook on the BBQ and enjoy a beer. 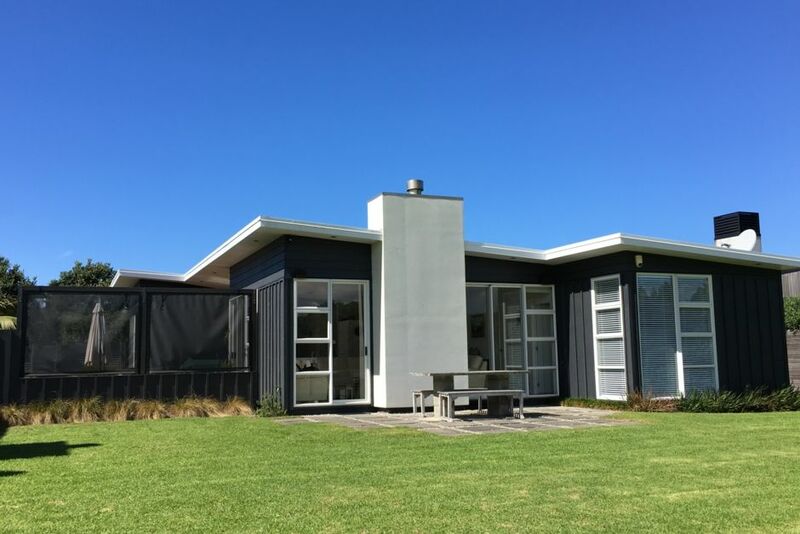 From the house you will enjoy looking out over the seventh fairway of the beautiful Omaha Beach Golf Course and beyond to the stand of native bush. In the evenings, conditions permitting, you will be delighted by spectacular sunsets as you relax and recount your days adventures. Can park up to 6 Cars off the road in front of the property. Large Sun drenched Decked area with great indoor outdoor flow. Fenced. Tennis Courts within 50 metres. The property is situated alongside the 7th Fairway of Omaha Beach Golf Club. Lovely beach house, clean and well appointed. A great quiet spot but still walking distance to the beach. Perfect for young kids with the flat walkways and playgrounds. Absolutely loved our stay, already thinking about re-booking!! Great stay for small group and families! It's very spacious house with all needed amenities. Very close to the beach and 2 min drive to local shop. The only thing bit worring it is to close to golf course as the ball ended up couple times in the back yard when the kids were playing there. Other than that we were very happy with our stay.